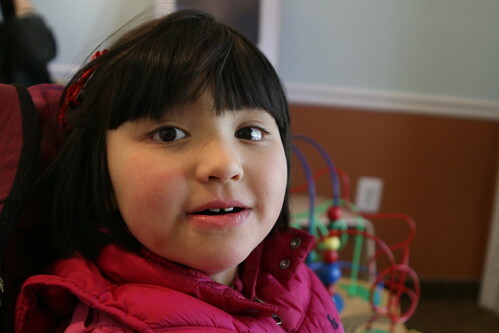 Last week Edda had back-to-back dental/orthodontic appointments. The dental appointment was a surprise - Edda's spacer was falling out. She had the spacer put in when she lost a baby molar tooth when it abscessed about a year ago. The spacer is suppose to hold the space where the lost tooth is suppose to be so that it doesn't slide closed during the 3-4 years we are going to need to wait for the adult molar to come in. The regluing took 5 minutes. 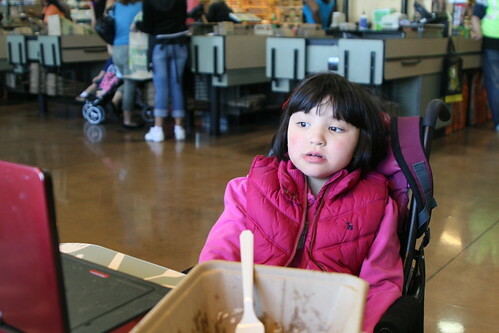 Then Edda and I went out to lunch at Whole Foods. We tried a bunch of stuff from the salad bar. Edda was having a blast and happily making a lot of noise. It was a lot of fun to have a girls only lunch. I was trying to shush her a little, not that I think it would have worked, but basically because I think it makes other people around me more comfortable if every 3 minutes I just say "Shhhhh!" so it seems like I'm trying to make her quieter. A Whole Foods employee walked past my while I was saying "Shhhhh", and she said quite loudly, "That's all right, you know, she can be as loud as she likes!" Very sweet. 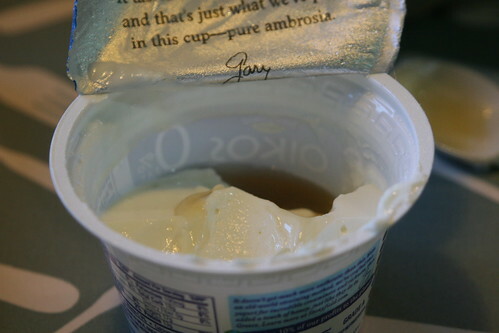 My splurge these days is Greek yogurt. Next: the orthodontist. I love my pediatric dentist who recommended the particular orthodontist. I was a little nervous going to the orthodontist. Edda has a terrible underbite and her front teeth are a little splayed, so I was a little worried that I'd be "convinced" to do a lot of orthodontia which would both be painful/uncomfortable for Edda and expensive for me. However, I fell in love with the orthodontist who said the perfect thing, which is that he knew that what I wanted for Edda are low risk / high benefit procedures and that although he could recommend starting to correct the underbite, that frankly as she is chewing and eating well, it would be not worth the effort and pain. It turns out, he has a nephew with Angelman's, which meant that he has a familiarity with disabilities and has a now has an orthodontic practice which takes care of a lot of special needs patients. Hooray for folks who know and work with people with disabilities. So we are going back in a year just to keep an eye on Edda's teeth.. Loved this post. I do the same "shh" with Audric for the same reason and lately he's been VERY loud. I liked that an employee said what she said (minus the "shh" part). Don't you just love finding those people who have some understanding of special needs? Sounds like you have a great orthodontist! I might need a referral for one, so I hope its okay to ask you when that time comes :) Have a great day! Yes! I think there are more people familiar with special needs that one realizes. I'm happy to give you the referral, just give me a holler when you need it!